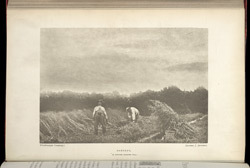 "Our frontispiece this month is a reproduction, in Woodbury gravure, of the photograph which took the first prize in the Amateur Photographer Monthly Competition for October, - 'Harvesting' - and is by Mr. A. J. Jeffreys, of Chelmsford. The title given is 'Harvest - As Evening Shadows Fall.' The photograph was taken at the end of August, and the print is on Whatman's Creswick paper, sensitised by Mr. Jeffreys, and toned with platinum. The effect of the rough paper print has been aimed at in the reproduction, and, so far, we think it fairly does justice to the original."